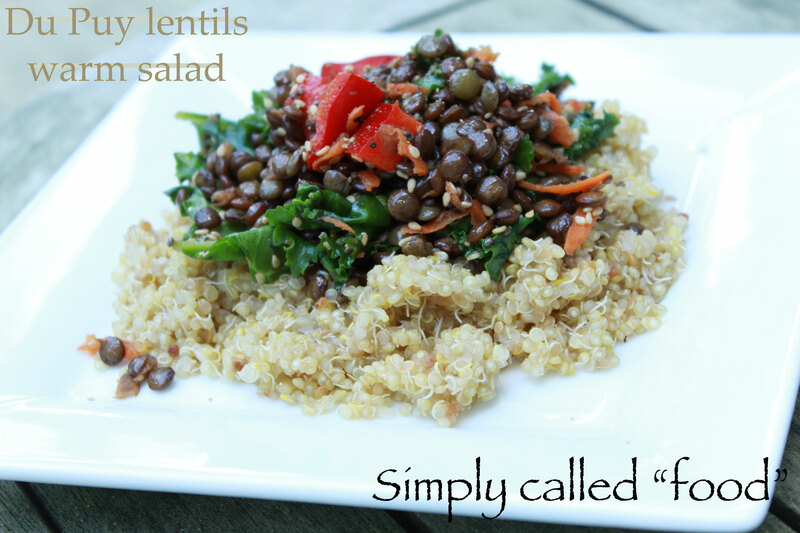 Du Puy lentils warm salad | Simply called "Food"
Lentils. You can have them in so many ways, I just put this recipe up to give an idea. They don’t take long to cook , so you can have your supper ready in less than half an hour. You can choose to have them to replace meat because they contain lot of protein or you can simply have them as a side dish with some olive oil, herbs and garlic. The Du Puy lentil keeps its shape so in your plate it does look good. It has a nice colour and a great nutty taste. I decided this time to try sprouted quinoa. It really taste good. It is not as grainy as regular quinoa, but both of them are good. Cook your lentils in the vegetable broth for approximately 20 minutes or until tender. Drain the excess of water. At the same time, cook your quinoa according to the instruction. It take about 15 minutes to cook. In the meantime, cut your pepper, the kale and grate the carrot. In a salad bowl, mix the olive oil, the vinegar, the mustard, the salt and pepper. Combine the vegetables, the sesame seeds, the hemp seeds and the lentils that are still hot. 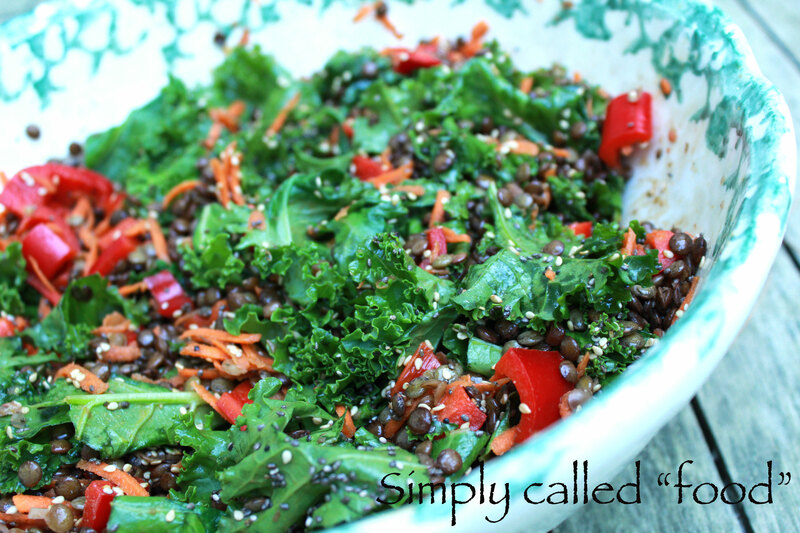 Stir everything so all the flavours blend, the lentils absorb the dressing and the kale gets softer. Put it on your quinoa and there goes your quick meal. Tags: Fruit and Vegetable, Gluten free, Kale, Lentil, Quinoa, Seeds, Vegan, Vegetarian. Bookmark the permalink. This salad looks so fresh and healthy. And what beautiful photographs. Thanks for sharing this. Thanks a lot. It was really good and the kale stayed crispy even warmed. ooh we had a version of this today … soooo yummy! I had some left over of it. Funny. Thanks a lot, it’s nice to get comments from readers. Looks fantastic! I love adding different things to salads, I will have to into getting more lentils into our diet, admit that’s a food we don’t do enough of. It’s so fast, so quick and tasty! Thanks for your comment, it is and there’s not a lot of fat in it!